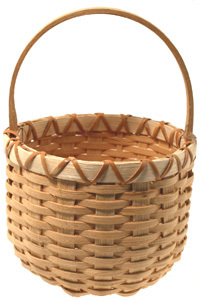 The Original Beginner's Basket Weaving Kit is a Shaker-style round bottom with oak notched handle, 1/2" flat, 3/16" reed, cane. Excellent first basket weaving choice. 6" diam. x 8" tall. Very easy classic design. Ages 12 and up. SKILLS LEARNED: round splint base with odd number of spokes, plain weave, Cut and Tuck, rim lashing and notched handle application are skills learned with the Original Beginner's Basket Weaving kit.